I'm using PrimeFaces 3.0 and JSF 2.0. In my webapp, I display a modal dialog over the page when the user's browser has been idle for a certain length of time and this triggers a session invalidation on the server side via an Ajax call. 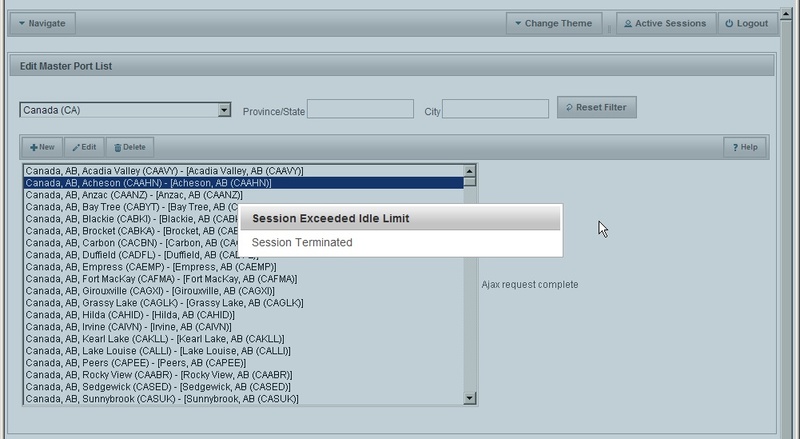 On the browser, the modal dialog displays a simple message that the session is terminated due to exceeding the idle time limit. This all works fine (see screenshot). What I want to do is override the default opacity of the PrimeFaces dialog overlay and make it more opaque. Does anyone know how to do this? The target browsers for the user environment are IE 6 and 7. According to www.w3schools.com the opacity CSS attribute is non-standard but is proposed for inclusion in CSS3. How to override the computed style in css? What html or css attribute should I modify so that a mobile browser shows the website with no blank space on the right? How to use 100% CSS background-image with scrolling content? Having Two HTML issues with PHP DOM: 1.) DOMDocument::createEntityReference $name values and 2.) how to add multiple CSS classes an element? here you can see character codes as well as friendly names. For your &#215, you will use "times" and for the second question, yes, you can do it like that. How to avoid this hardcoded index.js when use webpack? CSS, how to put a div inside a div that is responsive? How to turn off spell checking in CSS? There isn't a solution that doesn't involve adding more elements. Unfortunately, only one background image can be applied per element via CSS. How to morph a plus sign to a minus sign using css transition? How do you change the font-size of a custom css style? How do I get text to overlay on top of an image in Dreamweaver? How can I vertically align two floated divs? How to bring parent div front? How do you create different CSS for dynamically generated elements? How to hide expand/collapse icon in vaadin treetable? How to handle mouseover properly on a flipped div? Flexslider - How to make two slider functioning together (images and a paragraph text) using a single directionNav? How do I pick an image from a set of images on my Ajax form? How to change the colors of a website in real time? How to get all child elements using an xpath selector? How to create a button with a CSS-animated background? how can i style processing.js element?